With a No. 9 ranking in all the major polls, the University of Colorado football team is experiencing a resurgence this season, which may lead to a rare CU sellout for this weekend’s final home game against Pac-12 rival Utah. 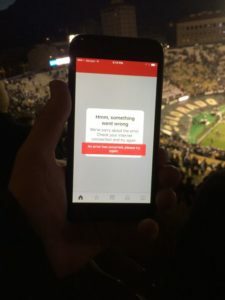 While the Buffs’ on-field performance in 2016 may have ended years of fan frustration, the 50,000+ fans expected to be in attendance at Folsom Field this Saturday may still experience another form of frustration, mainly in trying to get their mobile devices to connect to the Internet. 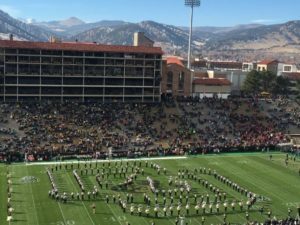 According to school officials, there is no full-stadium, fan-facing Wi-Fi or cellular distributed antenna system (DAS) network in Folsom Field, and no plans to bring either to the venue anytime soon. Instead, most fans at the on-campus stadium will rely on one of two nearby macro sites, one each from top wireless carriers AT&T and Verizon Wireless. According to Jeff Lipton, director of real estate for CU, the school decided to pass on bringing Wi-Fi or DAS to Folsom for a number of reasons, including the cost of the systems, the infrequent use of the facility, and potential loss of network control to prospective suppliers. “Nationally, stadiums are challenging” when it comes to cost justifications for installing wireless networks, Lipton said in a recent phone interview. While Lipton claimed that CU “hasn’t been sleeping on this,” saying the school has been reviewing wireless stadium options for several years, he added that CU had concluded that a cellular DAS wasn’t a good fit for Folsom, which has been the home of CU football since 1924. 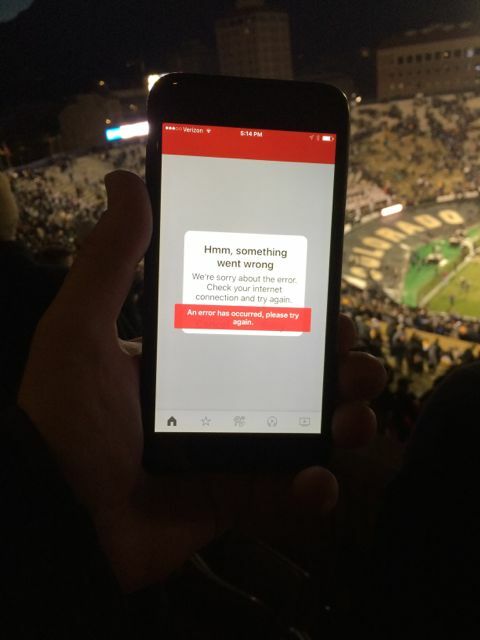 Error message shown while trying to connect to ESPN’s website at Folsom Field on Nov. 19. One of the main problems is, Lipton said, justifying the cost to bring connectivity to a venue that is only used a handful of times a year. In 2016, Colorado had six home games on its football schedule, the main use of 53,613-seat Folsom Field. This past summer there were two concert dates with the Dead and Company band that filled the stadium, and the stadium is also used as the finish line for the annual Bolder Boulder 10k on Memorial Day. Though the crowds that do come to Folsom would no doubt enjoy better connectivity, right now it’s not in the cards, Lipton said, especially from a cellular DAS perspective. 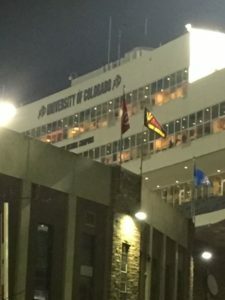 “We looked at DAS for the main part of the stadium but determined it was not cost effective, and the vendors wanted a connectivity exclusive” for the rest of the campus, a deal Lipton said CU definitely did not want to agree to. “We like to control our own [wireless] destiny on campus — we’re not going to give that up in a deal to get DAS,” Lipton said. And, Lipton said that “I’m not sure that [technically] in the long term, DAS is the solution” for stadium networks. What’s more interesting to CU is finding some way or waiting for new technology to emerge to make owning and operating a Wi-Fi network inside Folsom something that makes sense. When it comes to Wi-Fi, Lipton said that CU has been aggressively installing it in many of the 12 billion square feet of building space it manages at the Boulder, Colo., campus. Around Folsom, there is free public Wi-Fi available at the new Champions Center (an indoor practice field and offices building located adjacent to the east side of Folsom Field) as well as in the attached parking structure. There is also some free Wi-Fi available for suites and club spaces in the newer structures on the east side of Folsom Field, but nothing for the balance of bowl seating in the stadium. Folsom’s east side structure, which does have some Wi-Fi inside suites and club areas. “We have pretty ubiquitous Wi-Fi throughout campus, and we installed it and run it,” said Lipton. In terms of bringing Wi-Fi into the Folsom Field bowl — as well as to the stands at the Coors Event Center, the school’s 11,00-seat basketball facility — that idea is still being studied by an internal working group, Lipton said. Any Wi-Fi network that does end up getting built inside Folsom would also have to surmount the non-trivial challenge of bringing wireless networks to a facility with parts that are nearly 100 years old. Part of the bowl also sits in the ground, bringing another degree of difficulty to the idea of getting cables underneath the stands (for possible under-seat or railing-based antenna options). But for newer parts of the stadium, including the north end zone structures and the new east side, bringing connectivity to the stands outside wouldn’t be as difficult. At the 11,064-capacity Coors Event Center, Lipton said there is some CU Wi-Fi inside the building, but it was not designed for full-stadium crowd access down into the seating bowl. 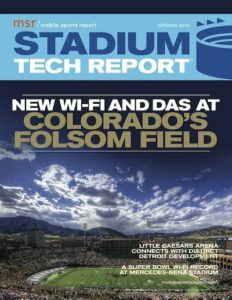 Though Lipton claims that the two Folsom macro sites — one atop the roof on the stadium’s west side building and another on a building across the street — are working “much better” this season, an MSR visit to Folsom for the Nov. 19 home game against Washington State saw almost zero connectivity, on both the cellular and Wi-Fi front. A look at the newer north and northeast structures at Folsom Field from the east stands. 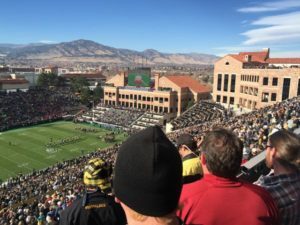 Though our tests were sporadic, with only one phone in one part of the stadium, our not being able to send a text message with a photo of the stunning Colorado Rockies backdrop was probably something many others experienced inside Folsom last week, where 48,658 fans saw CU beat WSU 38-24. On the Verizon network, we were almost always looking at a “1x” number for connectivity, which pretty much guaranteed no signal all day long. Even inside the east building’s 5th-floor club area, where we detected the CU campus Wi-Fi network, our phone couldn’t connect, briefly showing a link but then dropping it as soon as we tried to do anything. There was no visible promotion of the CU Wi-Fi, or any instruction about whether fans should use one of two visible SSIDs, one with a “guest” label and one without. Back out in the stands, we tried to get to the ESPN website to see other college scores, but again our device failed to connect. While Lipton admitted that “traffic on [football] game days can overwhelm” the macro sites, he still thinks any advanced connectivity has to make fiscal sense. 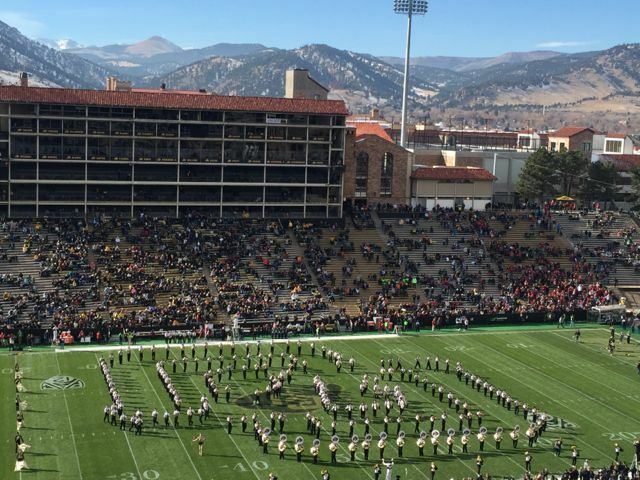 As the one who says he signs contracts for such deployments at CU, Lipton said “there’s an art to every deal.” For Folsom Field connectivity, however, that deal hasn’t yet been done.